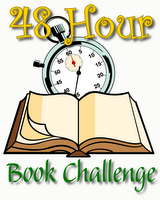 There are still almost two weeks until MotherReader's 48-Hour Book Challenge kicks off, but I just wanted to post a small reminder about it. I keep forgetting that it's nearly June and I've been so busy with things that I can't ever really tell you what day it is, but June 5-7 is definitely marked on my calendar. Lest you think that you're too busy to participate, I should tell you that I will be going out of town that Friday night and not returning until at least Saturday afternoon and I'm still signed up. I'm not sure if I'll be able to join the 20-hours club this year, but I'm certainly going to give it my best shot!! It's going to be great fun and for all of you who are signed up, I'll tell you what I learned last year. I started off with the goal of reading as many books as I could. I consider myself a fairly fast reader, but I quickly found that there was NO WAY I was going to keep up with the bloggers who were reading 20+ books in the 48-hours. And comparing my reading times to other bloggers' was just frustrating and disheartening for me: OMG! She read Rumors in 2.5 hours and I've been reading it for 4 and I'm not done yet! I am so inadequate! Woe is me! I also had picked out a stack of books that I thought would make for quick reading. I had several series books and short books, figuring that I'd do better with reading a whole bunch of short books rather than a handful of longer books. That didn't work so well for me, either, as I felt bogged down by books that I wasn't really that excited to read. So what worked for me was concentrating on the time spent reading, rather than the number of books read. After the first evening and morning, I decided to try and read for at least 20 hours and not worry about how many books I read in that time. I also put down all the short books that I had only really picked because they were short, and I started reading the books that I was really excited about reading. Ohhhh that made such a difference! Suddenly it was fun! I wasn't going to beat all the other bloggers and read the most books, but that's not what it should really be about anyway. It's about dedicating time to reading and blogging. It's about being part of a community and encouraging others. And it's about having fun. Most of us aren't paid for this blogging stuff, so if it's not fun then why are we doing it? That's what worked for me last year and that's what I'll be doing this year - picking up books that I've really been looking forward to and aiming to read for at least 20 of the 48 hours. And if I reach my goal, that's great. If I don't, I know I'll have fun trying. And since the 48HBC is coming up in a couple of weeks, maybe I'll save a few books I'm really looking forward to for that weekend. So far, my list includes Marcelo in the Real World, Crows and Cards, The Evolution of Calpurnia Tate, and The President's Daughter, but I'm sure more will crop up. What about you? What's worked for you in the 48HBC? What are your goals? What books are you looking forward to and/or saving for that weekend? I love your book choices! Going for number of hours instead of number of books sounds like a GREAT plan! I loved both Marcelo and The Evolution of Calpurnia Tate, I'm sure you'll really like them! I'm trying to be a bit more relaxed this time around too. We have a garage sale going on that weekend and I'm just going to read where I can...I think I'll do just fine! Thanks for the plug for the 48HBC. I've actually made a change this year and am NOT giving prizes for the most books read. I also wanted to take the emphasis off of the number of books - which is about the type of books one chooses and how fast a reader one is - and put more weight on time committment. There will be first, second, and third prizes based on the hours put in. There will also be random "door prizes" of signed books that any participant can win. What has worked for me is to vary the kind of book I'm reading. I usually stick to YA - because that's where I need to catch up - but I'll read a mystery, a teen angst book, a fantasy, etc. Mix it up. Then I usually write my review after each book to break up the reading. I always have something else to do during the weekend and find that also helps to break up the reading time. Another change this year is that participants can include time reading other participants blogs. That will encourage us to support each other and also give more opportunites for breaks. Maybe the fates have aligned?